So it was Adam Maddox that took the mound tonight against the Nevada Griffons. Manager Matt Johnson obviously made a great choice by calling number 22 to the mound as he led the team to their first MINK league championship title. Oh Yeah, he also didn’t give up one stinking hit all night. Adam Maddox pitched a complete game no-hitter against the Nevada Griffons to clinch the MINK league championship! Maddox was fantastic. He had hitters off balance all night. His breaking pitches were amazing. It seemed as if he got a lot of called strikes. This is an accomplishment because he was not receiving a generous strike zone. The umpire would not give Maddox the low strike. This caused a lot of long stares in at catcher TJ Daily for Maddox wondering why he couldn’t get that pitch called a strike. Maddox had trouble with the small strike zone as he walked 6 batters throughout the game. To be as effective as he was on this night he had to be what pitching coaches call “effectively wild” anyway. The final strike of the game was high, in all fairness, it was high. Maddox had earned that call by being around the zone all night. If you don’t get the lower half of the strike zone you should get the high strike. This is an amazing accomplishment and I’m sure it has to be the greatest performance of the young pitcher’s career. I remember Maddox pitching a similar game last year actually. St. Joe was in the playoff heat with the Chillicothe Mudcats and the Mustangs had to sweep 3 straight games against the Mudcats. Maddox got the call in the first game and pitched what I think was a complete game shutout. This is all to the best of my recollection. Big kudos should also go out to Maddox’s catcher TJ Daily, the catcher never gets credit in a no-hitter but should. Every no-hitter has a great play or two to attribute to the great game, it is almost inevitable. This game was no exception. The first great play came in I believe the top of the third inning. A high chopper was hit over the middle and second baseman Brent Seifert ranged all the way to the shortstop side of the bag to snag it and make a strong throw on time to first baseman Brock Chaffin. Getting to the ball was an accomplishment but the throw was something to behold. It was a long throw against his body and he delivered it to first base in time. The second great play came around the 6th inning. With a runner on 2nd base and 2 outs a low line drive was hit to center field and Cameron Bentley made a diving catch coming in on the ball. He caught the ball what must have been inches from the ground; in fact; I thought live that the ball had dropped. The second base umpire ruled it a catch and I’m sure it was the correct call. On a personal note; it was simply amazing. I never thought I would EVER get to witness a legitimate no-hitter in person. I am a huge baseball fan and this is really one of the “holy grail” accomplishments. 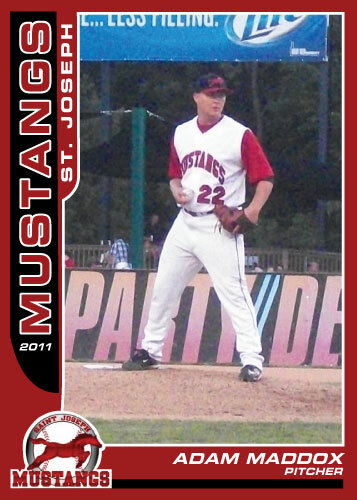 I was tremendously jealous when Mustangs pitcher Cody Cunningham threw a no-hitter earlier this year against the Omaha Diamond Spirit. The game was in Omaha so I obviously did not attend; but this time, I saw every pitch. A big congratulations and thank you goes out to Adam Maddox.